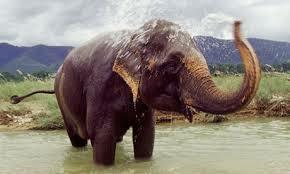 Chitwan National Park was declared UNESCO Natural Heritage Site in 1979. This park is situated in southern central Nepal, covering 932 sq.km covered with deciduous forests overlooking the floodplains of Narayani, Rapti and Reu rivers. The park headquarters at Kasara are 21 km drive from Bharatpur which is 20 minutes by air or 146 km by road from Kathmandu. There are many Resort hotels and lodges in the park. 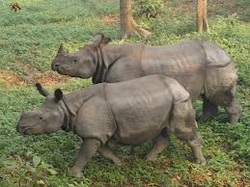 Chitwan National Park offers a huge variety of rich ecosystems that includes mammals, birds, reptiles and various water based animals. The highlights of this park are the 500 Asian one-horned rhinoceros (One-Horned Rhino) and several hundred nocturnal Royal Bengal Tigers that live in the dense forests of the park. You will discover a lost world of towering trees and twisting vines, pre-historic rhino and elephants, crocodiles, python and deer, and brilliantly colored birds. 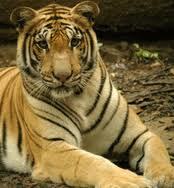 If you are fortunate – the superb Royal Bengal Tiger.